My name is Harrison, I am twelve years old, and chocolate ice cream is the single greatest food in the world. I read the Book Scavenger. I chose it because I wanted a fun, happy book, and this book fit that description. My favorite part was at the end, when the big twist and treasure were revealed. I would try to solve the problem, which in this case was a series of riddles and puzzles. I love puzzles, so I probably would have done something similar to the main character. Hey, do you like riddles? Of course you do! This book is filled with them. You would totally love it. It is cryptic, mysterious, but also fun-filled! I think it looks good, and compels the reader to read on. Even the cover has a mysterious, cryptic, but also fun essence! I would not like to read another book with these characters. I think the story is over, and anything else would be too much. Do any of the events in the story relate to your actual life, or is it completely made up? Emily probably started out as being a version of myself–we’re both bookish and introverted and imaginative. Matthew was probably inspired a bit by my own older brother. And James started off as a mix of several different people I’ve known who are smart, funny, and don’t seem to let peer pressure to act or be a certain way get to them. But that’s just where those characters started. With all three of them, their personalities took on their own shapes the more I wrote about them. Now Emily, James, and Matthew seem like their own people to me as opposed to fictionalized versions of real people. Thank you, Harrison, for the great book recommendation. Oh, and if the idea of solving books and following a book scavenger sounds fun, you can play along in real life. 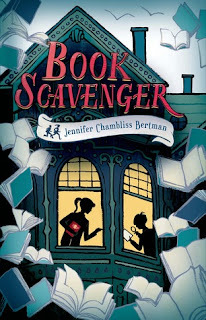 Copies of Book Scavenger, by Jennifer Chambliss Bertman are being hidden and scavenged around the United States. You can play along. Visit the Book Scavenger web site for more details. Oh, I've been wanting to read this book! Thanks for the great review, Harrison. Now I really want to read it. I love riddles!